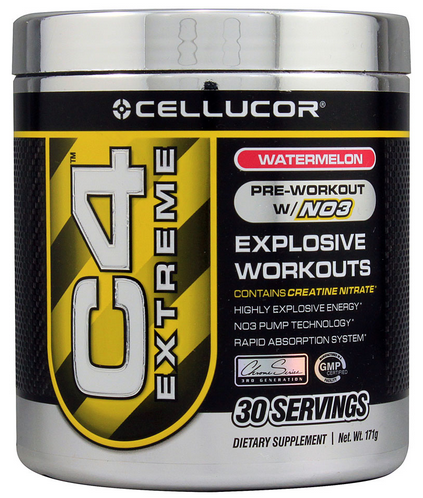 C4 Extreme by Cellucor is one of the most popular and highly recommended Pre-Workout (PWO) supplements on the market and is commonly known as the “gateway” pwo that is recommended to those who are looking to start taking pre-workout supplements. At first glance it comes in a tub with a silver tub with yellow and black detailing to give it a “dangerous” look, which is very common for pre-workout supplements. The tub have a few buzzwords written on it like explosive, pump technology, rapid absorption, once again this is very common for pwo supplements. The flavor I tried was Icy Blue Razz, the blue raspberry flavored option of this pre-workout which was suggested by a friend. Upon opening it up a small cloud of blue power rose up, the C4 power is very fine and you should be careful when opening and handling the powder as it can spill or enter the air from the slightest mishap or nudge. The powder itself is bright blue and comes with a 6.5 gram scoop which considered 1 serving as well as a silica get bag to keep the power dry which I recommend keeping in the jar. Although I have only tried the Icy Blue Razz version of C4 Extreme, it is the best tasting pwo in my opinion. When it comes to pre-workouts they tend to be over sweet to mask the taste of the chemicals, or they are extremely bitter and nauseating due to the lack of flavoring. C4 has the right might of both, it’s sweet but still has a little bit of bitterness which makes it easy to drink. As described before, it’s a very find power and mixes easily. Like all pwos, C4 extreme falls into the category of pwos that contain caffeine and Beta Alanine which gives you a very distinct type of energy compared to other pre-workout supplements which may contain other ingredients. C4 Extreme contains Vitamin B6, B12, C as well as Niacin, Folic Acid and Calcium but what is most important are the Beta Alanine, Arginine and their proprietary blend called NO3-T which contains Caffeine as well as N-Acetyl L-Tyrosine. These are what you should focus on when looking at the pwo. Beta Alanine is an amino acid that is popular in the bodybuilding world for its energy and “pump” which helps to temporarily increase the size of blood vessels giving you a more vascular look. Beta Alanine is known to make people very jittery and anxious and itchy, so anyone prone to anxiety or panic attacks should stay away from anything containing beta alanine as it can make symptoms worse. Arginine, another amino acid is known for dilating arteries. Caffeine, a stimulant, is another very common ingredient in C4. Each serving contains 150mg, to compare a Tall (12 oz) Starbucks Dark Roast contains around 260mg of caffeine, so this isn’t a lot. Caffeine gives the user temporary energy which can last from 15 minutes to over 3 hours depending on how much is used and the tolerance level of the user. Caffeine, besides providing energy, raises blood pressure and can cause dehydration. C4 is a solid pre-workout supplement, I would give it an 8-9 for the effectiveness but it would go down as the user builds up a tolerance for the pre-workouts. Your numbers may go up, as well as how much and how quick you can workout. Also the beta alanine, which can makes the user feel tingly or itchy, is a great way indicator that your body has absorbed the C4 and that you’re ready to go. I also experienced a noticeable amount of sweating compared to working out with C4. Although it is good, tolerance can be built up quickly. After 4-5 days of using 1 scoop its effectiveness went from an 8-9 to somewhere around a 4-5 to the point that I was not sure if it was even helping me. This lead me, like many other users, to use 2 scoops before working out which raised the effectiveness back to around a 7, which dipped as tolerance kept building. At the same time I began to experience very minor breathing and heart issues like loss of breath, rapid heartbeat and a very strong heartbeat which I could feel. I would feel very nauseous during and after my use of C4 and I would crash after it wore off. The price of C4 is $60 for 60 servings as suggested by its manufacturer, which makes it quite pricey. However you can usually get it for a discount at Amazon HERE. I don’t believe it’s a very good value. The main ingredients in C4, or at least the ones that are the most useful, are the Caffeine and the Beta Alanine which can be bought separately for much less. C4 Extreme is arguably one of the most popular pre-workouts on the market and is a great way to get into using pre-workout supplements. Unfortunately, its effects are short lasting and its tendency to build up a quick tolerance leading to increased dosing makes it very expensive. It is one of the best tasting pre-workouts you can buy, but it is certainly not the most effective or affordable pre-workout supplements on the market at the moment.